Oasi Blu is a fantastic apartment on the third floor near the bay of Praia, the major beach of Praia, with various restaurants and bars. You can take a boat or water taxi to Capri, Amalfi and Positano here. 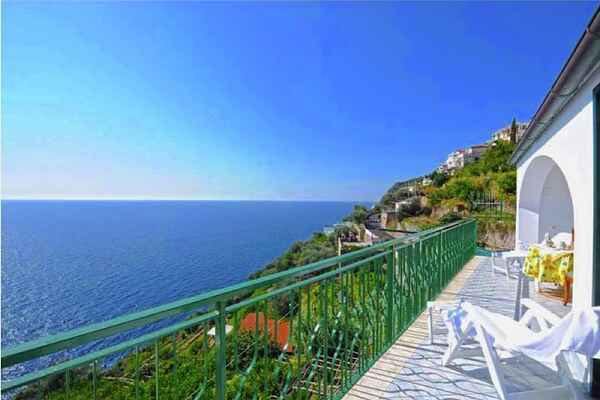 The apartment has a strategic location near a bus stop to go to Positano and Amalfi. The centre of Vettica di Praiano is only 15 minutes walk away from the apartment. Oasi Bu has been recently renovated and tastefully decorated with antique and beautiful furniture. There is a spacious terrace of 20 square metres with panoramic sea views from the Conca Dei Marini to Capo Sottile. The two bathrooms are decorated with colourful Vietri ceramics. The Jacuzzi in one of the bathrooms is heavenly to relax and enjoy in. The apartment is only accessible via 45 stairs and there is no lift. The car park is located under the building.